UK Qualified Dental Surgery Assistant 2010. 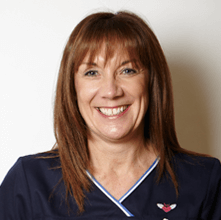 Louise has been at the practice since 2007 and has become a valued member of the team. She has nearly 30 years' experience as a dental assistant and receptionist. Her warm and sunny disposition will always make you feel very welcome. Her outside interests are travel, cinema, and socialising with friends and family.